It was summer of 2014 and we did not get any place for birding. My best friend Nipa asked me that when you are come to Mt. Abu? During my kid’s vacation we decided to visit Mt. Abu. Main attraction of Mt. Abu is Green Avadavat in birding aspect. We keep hope that we get chance to click the Green Avadavat. While going to Mt. Abu at ‘Sat-Ghum’ point we stopped to looking at the beauty of turning roads. It was evening time, suddenly we notice the Rufous-Treepie making very harsh calls. It looks like that Treepie was panicking and wanted to drive away some bird / animal / reptile. So we immediately start looking for the reason of that noise. We successfully locate target of Rufous-Treepie, it was a single raptor quietly perched on inner tree branch. The first thing strike in that raptor is its crest. 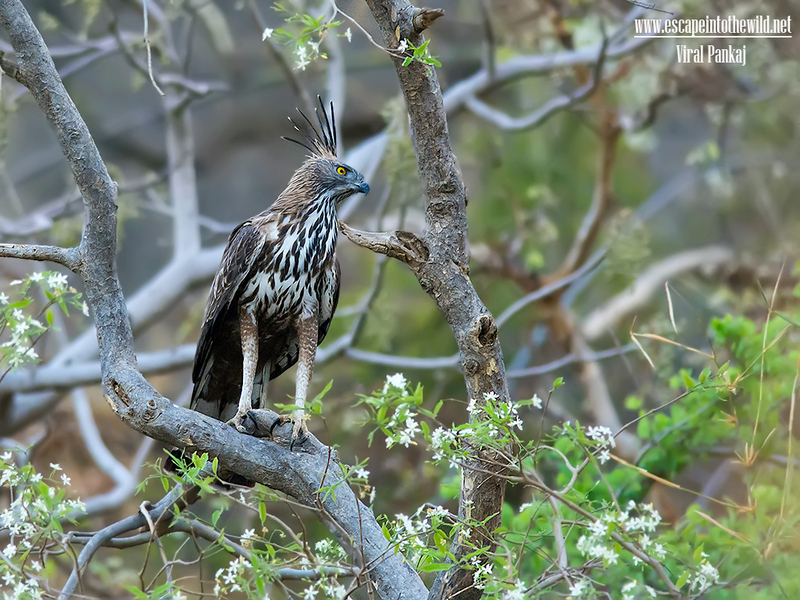 We immediately get to know that it is the Changeable Hawk-Eagle. Its Gujarati name is ‘Morbaj’- મોરબાજ. It has such a beautiful crest. We were pleasantly surprised. After few seconds Changeable Hawk-Eagle flew over, to be constantly mobbed by two Rufous-Treepie. The changeable hawk-eagle or crested hawk-eagle (Nisaetus cirrhatus) is a bird of prey species of the family Accipitridae. Changeable hawk-eagles breed in the Indian subcontinent, mainly in India and Sri Lanka, and from the southeast rim of the Himalaya across Southeast Asia to Indonesia and the Philippines. This is a bird occurring singly (outside mating season) in open woodland, although island forms prefer a higher tree density. It builds a stick nest in a tree and lays a single egg. There is two mainland races cirrhatus and limnaeetus. We saw is cirrhatus. Crest long and conspicuous and it was erected because it was alarmed. It takes flight and go away, lost in dense forest. We just talk about it in our remaining journey.